Princes had best avoid the home of this wrathful witch, as her temper often leads her to practice her spells of transformation! 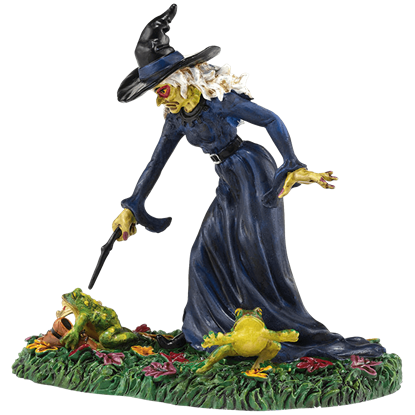 The Another Prince Croaks figure shows the witch cursing some poor fellow to live as a frog. Not everyone is smart enough to stay away from a scene that is obviously ominous. 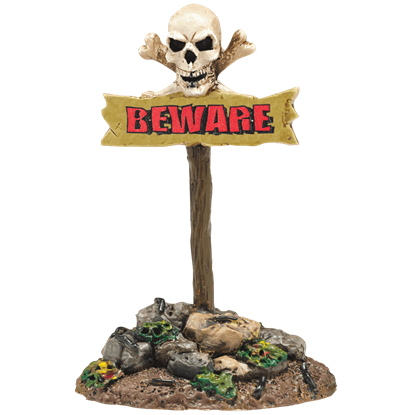 Well, at least you cannot say that you never warned trespassers with this Beware the Boneyard Sign as a part of your Halloween village accessories! What is a Halloween village without spooky lights, animation, and maybe even some eerie music? 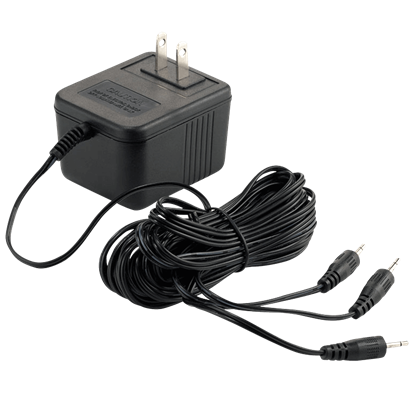 With this Black AC/DC Adapter, you do not have to let a limited number of outlets keep you from having the Halloween village of your dreams. 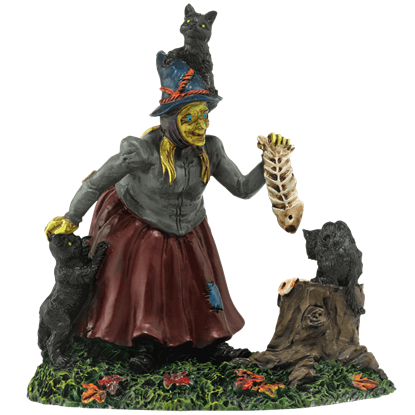 The cat lady witch serves a tasty treat to one of her favorite black cats while absentmindedly scratching the head of another feline begging for attention. The Black Cat Snack figure offers a colorful character to inhabit your town. 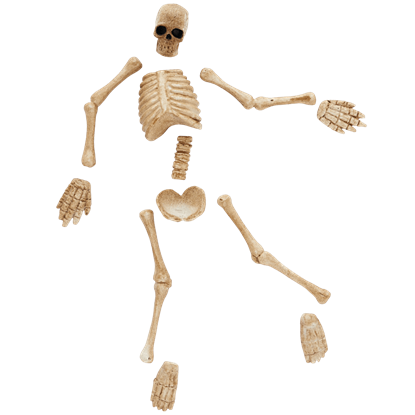 Create a scary skeleton in your Halloween town or scatter the remains of a local around the town with this Boneyard Bag-O-Bones! This multi-piece set makes it incredibly easy to decorate your Halloween village however you please. Make sure your Halloween villagers have a place to sit when they are lurking through the cemetery with this Boneyard Bench. 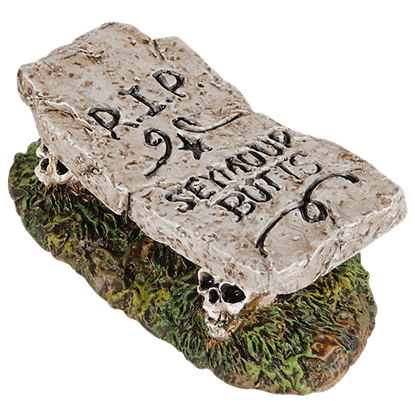 According to Seymours last wishes, he wanted his gravestone turned into something useful for the whole town. 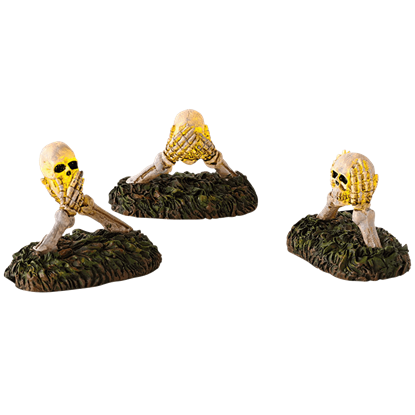 Based upon an iconic pictorial maxim, these Boneyard Do No Evil Lights bring life and, well, death to the Three Wise Monkeys proverb. Always keep your Halloween villagers in good spirits with the glow of these unique figurines. 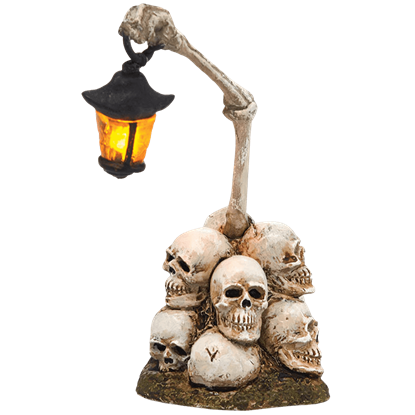 You may look at this Boneyard Lantern and be terrified, but do not worry! These guys are only trying to help you find your way through the graveyard. Add light and a unique, spooky effect to your Halloween village with this accessory. What could be spookier than using human skulls as lights on your front lawn? 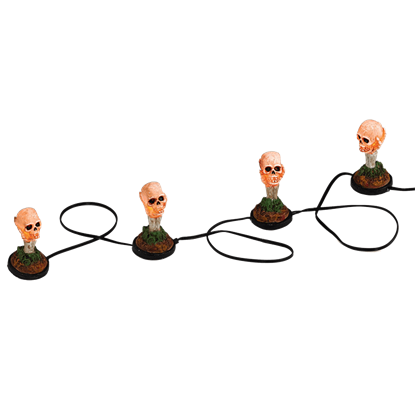 Great as a graveyard accessory or for placing in front of an eerie house, these Boneyard Luminaries will add quite a creepy glow to your Halloween village. One day, the groundskeeper at the graveyard was raking up leaves. Everything was normal, until he looked down and...EEEEEEEEEK! 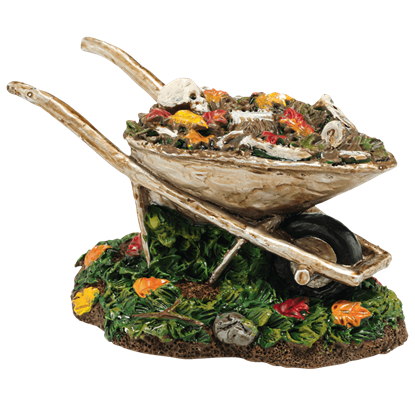 This Boneyard Wheelbarrow will add a fun and frightening touch to the scene in your Halloween village. 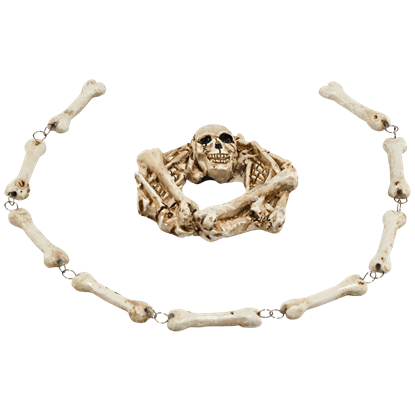 What makes a better menacing Halloween decoration than the bones of your enemies? Well, that might be frowned upon, but never fear! You can pretend by adding this Boneyard Wreath and Garland to your spooky Halloween village scene. Sometimes, people just do not pay close enough attention to road signs. Luckily, you have some scavengers who are more than happy to clean up the mess. 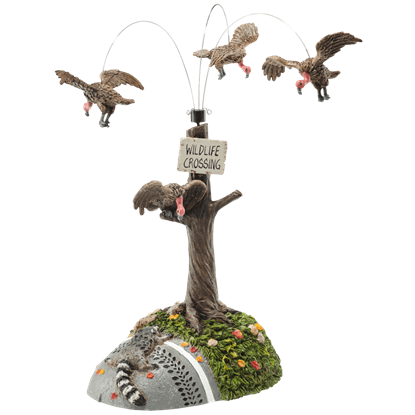 This Buzzard Delight is a great way to add animation to your Halloween village.